Back 40/1 Liverpool or 30/1 Man City to win when you join Betfair! Wanna bet on the Super Sunday match Liverpool vs Man City at incredible enhanced odds? 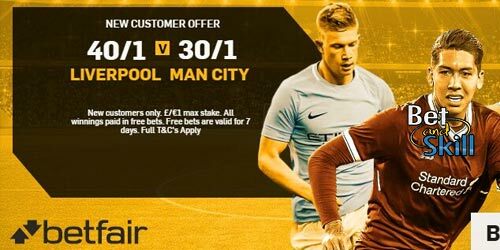 Betfair are offering 40/1 Liverpool to win or 30/1 Manchester City to beat the Reds + £100 in free bets! Liverpool advanced to the FA Cup fourth round last week after knocking out Merseyside rivals Everton (2:1), and are on a 17-match unbeaten run in all competitions. Man City started an incredible scoring spree with their 5-0 win against Liverpool in the reverse match back in early September but have failed to beat Liverpool at Anfield in the last 16 direct encounters. Which side will earn all three points? Claim 40/1 Liverpool to beat the Citizens or 30/1 Manchester City to beat the Reds ! Plus, get £100 in free bets for all our readers! Place your first bet (max £/€1) on Liverpool or Manchester City to win Sunday's blockbuster clash! Price Rush: Automatically get the best prices from The Exchange the moment you place your Sportsbook bets. Over 175,000 people have felt the Price Rush. Will you be next? Cash out: Take winnings early or cut losses. Cash Out singles and accumulators. You're in control - you decide! Bet on Mobile: Download the Betfair apps with ALL the features to bet on-the-go. Place a bet on Liverpool or Manchester City in the 'Match Odds' market at the enhanced price on the Sportsbook. Max stake £1. We will payout your winnings entirely in free bets if your bet is successful. What do I need to know about the bet bundle? Applicable to accounts registered in UK, Ireland, Spain and Denmark only. For every 5 x £10 single bets you will receive a £20 free bet. Max bonus a qualifying customer can receive is £100 in free bets. Customers who transact using Moneybookers or Neteller are not eligible. Bets cashed out do not qualify. "Back 40/1 Liverpool or 30/1 Man City to win when you join Betfair!"